Louise: Goodmorning, how can I help you? 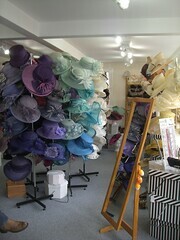 I glance at the hosts of wedding hats and fascinators arranged by colour and the large striped floorstanding hat boxes. wendy: It’s alright, I can come back in April, there’s no hurry, thank you for offering. Can I take some photographs of your lovely shop? This scribble was published on Saturday, March 27th, 2010. You can follow any banter on this scribble with the RSS 2.0 feed. You can share your inspired musings after typing the anti spam word near the bottom of the page. But no Pinging because its too naughty. Is this the shop in Wallingford? This is the shop in Wallingford. There is another Milliner, without a shop, in Wallingford. A wealthy town!